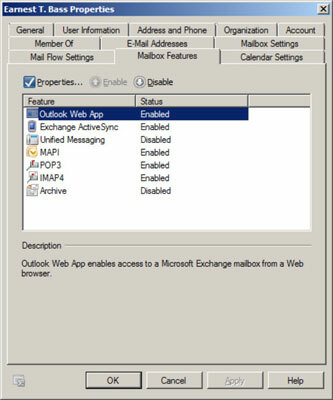 Exchange Mailbox Features refers to several features of Exchange network mailboxes that are controlled via the Mailbox Features tab of the mailbox Properties dialog box. Outlook web App: Lets the user access her Exchange mailbox from a web browser rather than from an Outlook client. With this feature enabled, the user can read e-mail from any computer that has an Internet connection. This feature used to be called Outlook web Access. Unified Messaging: Enables a premium feature (available only with Enterprise Edition) that integrates voice mail and fax messages with Exchange mailboxes. MAPI: Enables e-mail using the MAPI protocol. This protocol is enabled by default and is the most common way to access e-mail with Microsoft Outlook. POP3: Enables e-mail using the POP3 protocol. POP3 is disabled by default and should be enabled only if the user will need to access e-mail using an e-mail client that requires the POP3 protocol. IMAP4: Enables e-mail using the IMAP4 protocol. IMAP4 is disabled by default and should be enabled only if required to support an IMAP4 e-mail client. Archive: Enables the Exchange Archive feature, which is available only with the Enterprise edition of Exchange.